This month’s Charcutepalooza challenge is grinding. When I was reading up on sausage in Michael Ruhlman and Brian Polcyn’s Charcuterie, however, I stumbled across a recipe for one of my favorite foods: blood sausage. Yep, you heard right. I adore blood sausage. In all its forms. I accidentally wound up eating soondae (Korean blood sausage) in a restaurant in Queens where I ordered by pointing at an English-less menu. Halfway through the meal I realized this wasn’t your average sausage…but by that point I was hooked. Since then, I’ve never looked back, and have only forged on – to morcilla, black pudding…and now my very own homemade boudin noir. I’m not entirely sure why I love blood sausage so much. Maybe I watched too many episodes of Buffy in my formative years (back in the days when brooding vampire love interests knew how to rock vertical hair without looking like sparkly nonces). Cultural influences aside, though, blood sausage is really tasty. 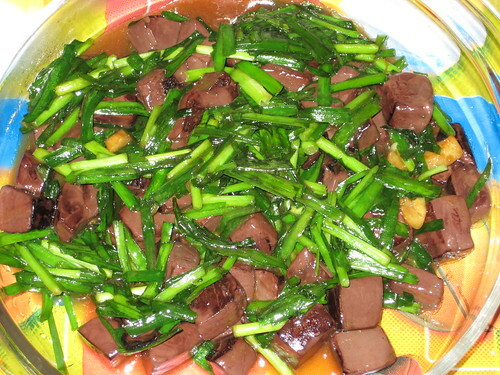 It tends to have just a little of the dark flavor of offal, and to have interesting texture from the various elements (rice, noodles, apples) cultures use to bind the sausage filling. 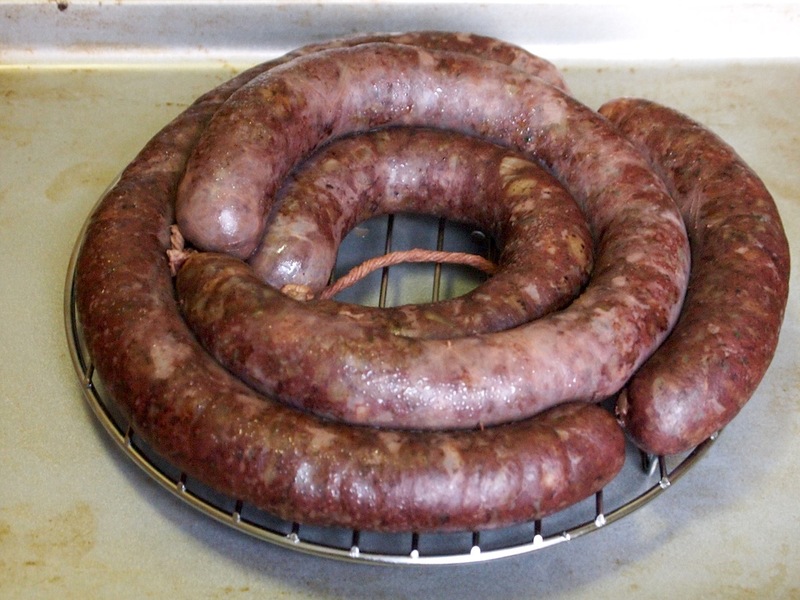 Though I know where to get morcilla and soondae, the Charcuterie recipe for boudin noir presented something new, interesting, and different. 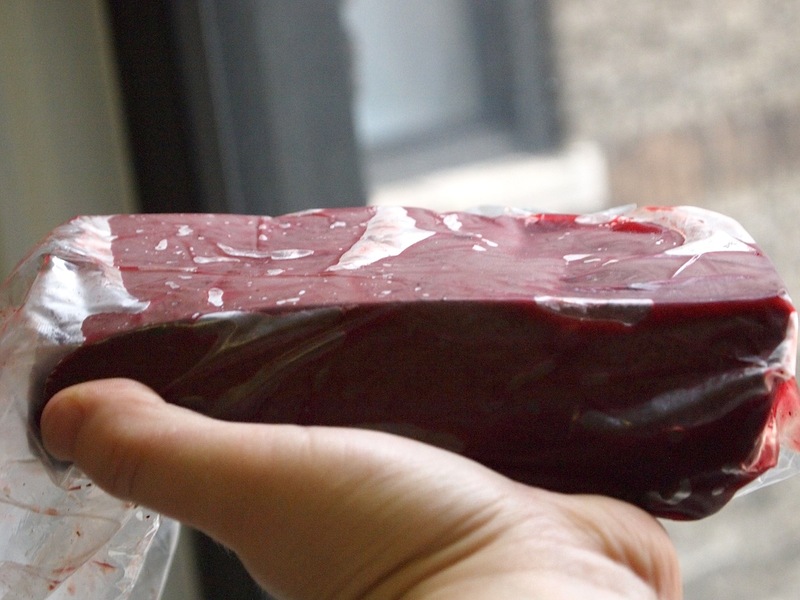 And since I just happened to be heading to Flushing, Queens recently, I figured I’d take advantage of the Chinese comfort with offal, and pick up some pig’s blood on my trip. This was a bit tougher than expected. First, I had some communication difficulties with the butcher; thankfully, after we yelled back and forth at each other in different languages for a couple of minutes (we all know speaking loudly and slowly obviously magically translates things), I remembered my friend Eric had sent me the Chinese characters for “pork blood” that morning as a contingency. Smartphone to the rescue! 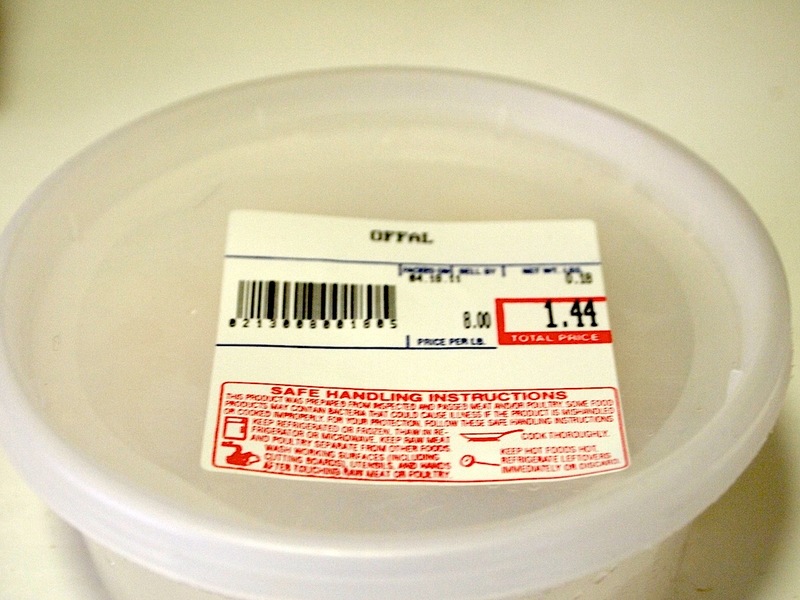 Once the butcher and I got on the same page, though, it turned out that they weren’t selling blood in containers: they were selling it in congealed blocks. Like this one. A block of blood was $3, so I sprung for it and decided to figure things out later. When I got home, I tweeted at Michael Ruhlman who, kind and considerate Charcutepalooza godfather that he is, answered the next day! Others, he said, had success with congealed blood. So, I decided to puree it up and make the best of things. 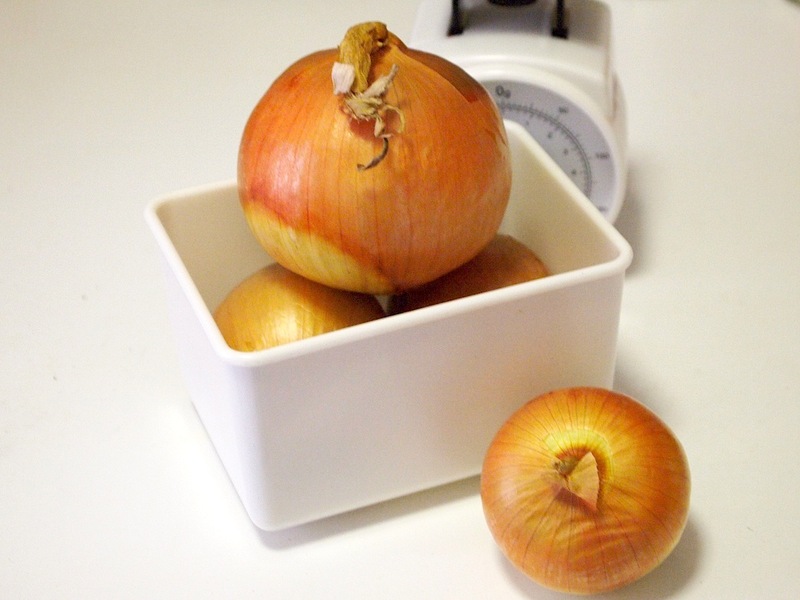 Both Ruhlman’s and Matt’s recipes have something in common: they measure by weight. I’ve been using a scale I picked up as a “for now” purchase in one of my more cash-strapped periods of law school. I’m totally upgrading this fall when I move from the Upper West Side to Brooklyn and (finally) have space and an actual income. 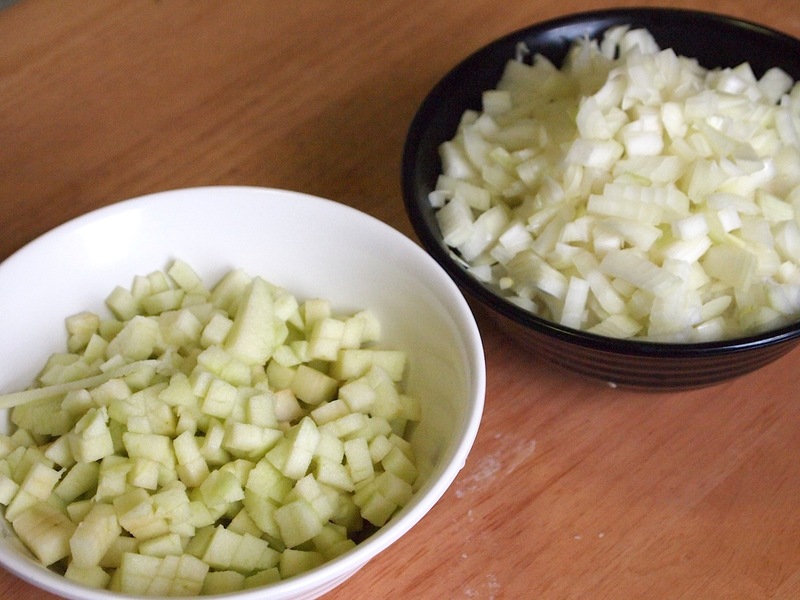 The scale did the job, though, and I successfully measured out and diced the apple and onion which form the “meat” of this emulsion-based sausage. I should tell you now: you’re not going to get any of those weight measurements here. Though this is not a Charcutepalooza challenge, I’m abiding by the groups injunction not to post recipes. I’ll take you through the process, but if you want to get more specifics, check out Ruhlman’s book or the Wrightfood link above. Surprisingly, I actually had a tougher time finding fat back than I did coming up with pork blood. I wound up running downtown to Ottomanelli’s before class after fruitlessly calling half the butchers in the city. When I got there…they charged me $7 for a pound of fat back. WHAT? That is highway robbery. My Neapolitan great-grandma probably rolled over in her grave. Next time I swear I will do her proud and haggle – sometime when I’m not exhausted and running across the city in gym pants. Overpriced or not, I diced the fat and poached it. I was a little worried about this step, to be honest: I was scared the fat would just melt. 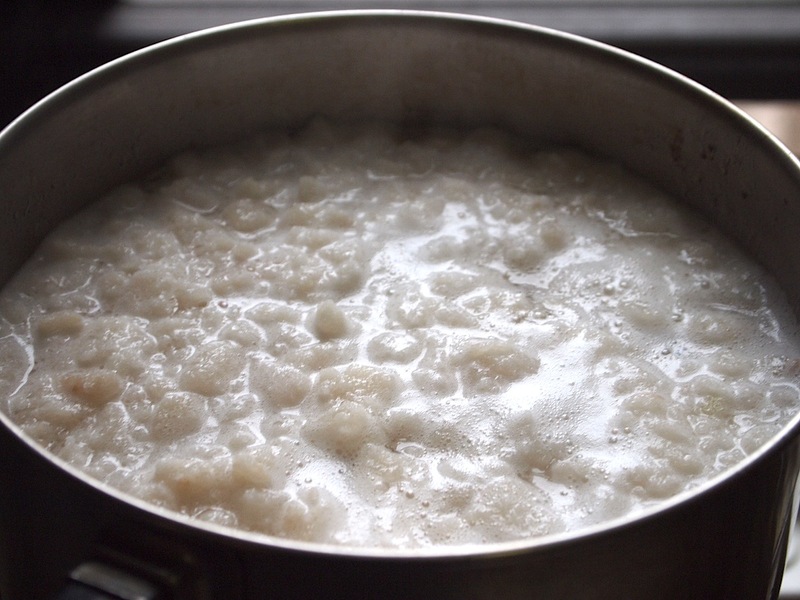 The consistency of the fat, though, and the low temperature of my simmering water, kept things nice and cohesive. Though the top did get pretty scummy. 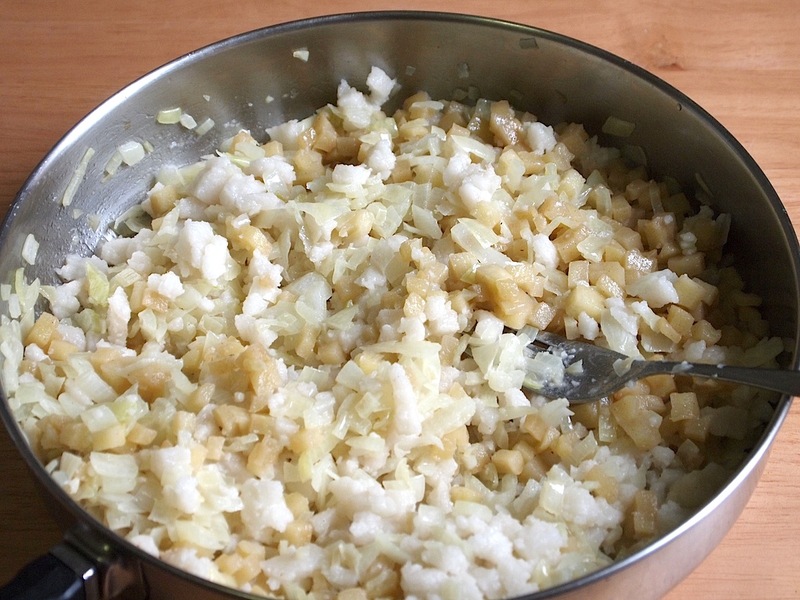 After poaching, the fatback got mixed in with the onions, which had been sauteed. This mixture, in turn, was added to the apples after they’d been cooked and boozed up with some Calvados. While the apples and onions went into the fridge for chilling, I prepared the casings. They’d been soaking for a few hours to remove salt (they come packed in it); I rinsed them off, let them drain, and tied the ends off with butcher string. I also pulled together the seasonings for the sausage stuffing: Brian Polcyn’s Pate Spice, salt, white pepper, and chives and chervil. 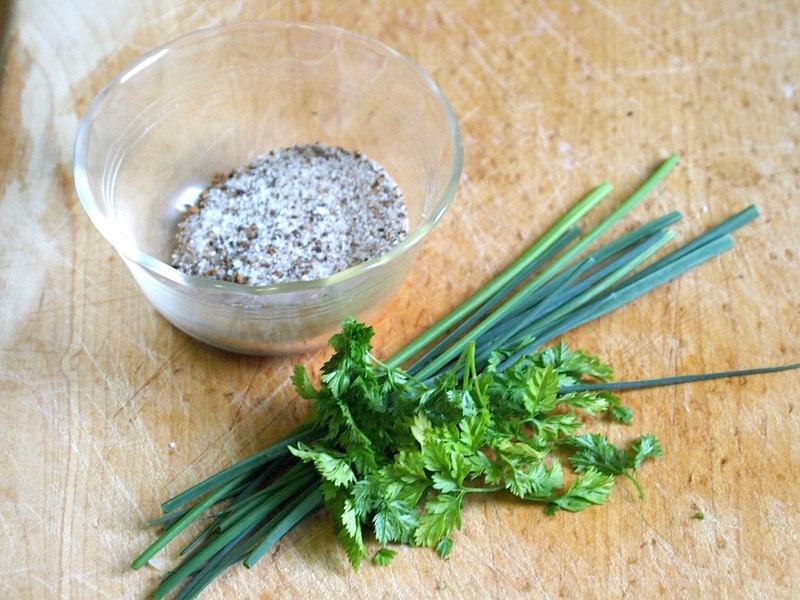 These last two herbs were really fun to have around the house after my boudin project: I rarely buy either of them, and I had a great time experimenting and tossing them into random meals (yep, I put chives in my oatmeal – sue me). By now, my pureed blood and apple-onion-fat mix were nicely chilled. As directed, I whisked together eggs and heavy cream, then added in the blood and seasonings, and folded in the apples and onions. The congealed blood made the texture mousse-like rather than liquid. I’m still wondering whether I should have marked that photo NSFW. It’s kinda…wrong. It was just too ridiculous, though – and my roommate was too awesome for braving the abattoir into which I’d turned our kitchen to take it. Sausage One wound up kinda funky: I tied it off in random places to correct casing breakage, and wound up with one baby sausage when I was forced to just cut off a length. For Sausage Two I got smart, gathered my casings as one does for regular meat sausage, and proceeded with far less mishap. 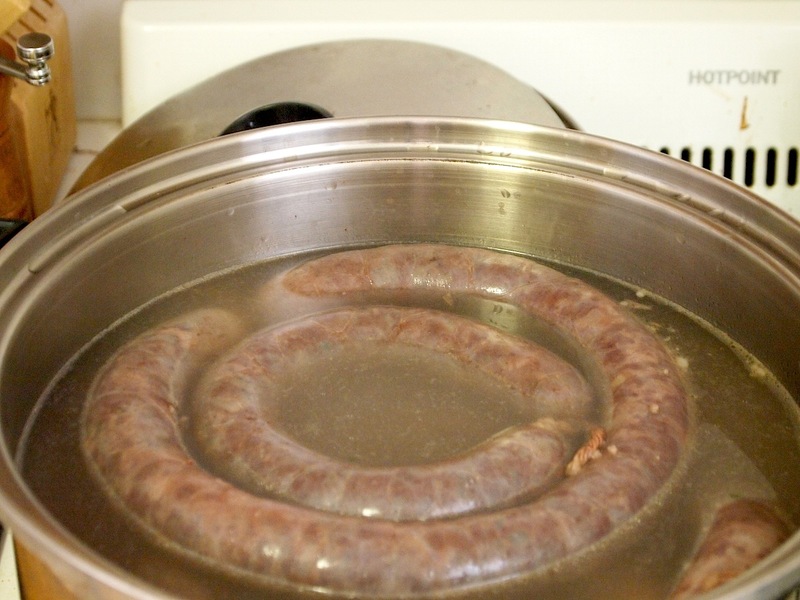 I eventually got my two sausages together, though, and got them into a perfect-temperature poaching bath. As you can see, the like floating; I had to weight them down a wee bit. Finally, after half an hour of poaching, we had some boudin! I cooled it on a rack, then refrigerated it overnight before cooking it up. I have a confession: my sausage broke a little. I think coagulated blood would work great in this recipe, but the congealed stuff was just too mealy. 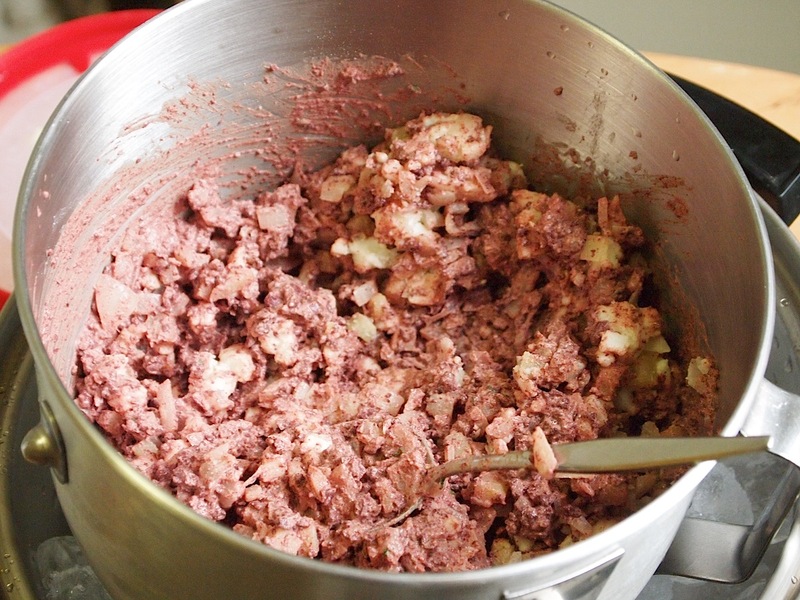 In their Charcuterie section on emulsified sausage, Ruhlman and Polcyn call broken forcemeats “nutrition for pets.” Blood sausage isn’t like other more cream-based stuffing emulsions, though: congealed blood can be added to soup in cubes or whisked into rice porridge – eating boudin noir filling is more like eating uncased sausage meat than like chowing down on the soup of pork, chicken, and milk of which a broken boudin blanc would consist. Even at points where the sausage crumbled, it was delicious. The recipe is beautifully flavored, and I can’t wait to get my gallon of liquid blood and try again. I served half of my sausage to adventurous friends at a Burgundy-centric wine tasty. The pairing was utterly awesome: we were drinking some lovely wines, and the simultaneous delicacy and meaty earthiness of blood sausage provided a perfect complement. A mixed experiment, overall, but one I shall return to soon: keep an eye out. I adore this post! Personally, I don’t ever think I’ll work up the courage to try blood sausage but I found this post absolutely fascinating! Well done! WOW! I’m sooo impressed! I feel the need to applaud you! That is totally impressive! It looks like fun and makes me want to try making sausage (the act of which always makes me think of the Seinfeld episode where Kramer makes sausage). Sounds especially good with the apples! You don’t see this often but I do love those sausages too. Nicely done,I love your photos and tutorial too! Yup, NSFW but so funny! I admire you for taking on new ingredients like this and literally getting stuck in. The results sound like they were worth the effort. I’ve eaten morcilla, and boudin noir and black pudding and I think I will probably remain the consumer rather than the producer but I really enjoyed reading about the process. Wow! Thanks for sharing all the hard and creative work and your tutorial! Amazing. I am personally not a fan of blood sausage, but after a trip to England my husband is a fan. Never realized you could even make this at home. Good for you! Great job! I am quite impressed. Celia, you are so brave and so cool! 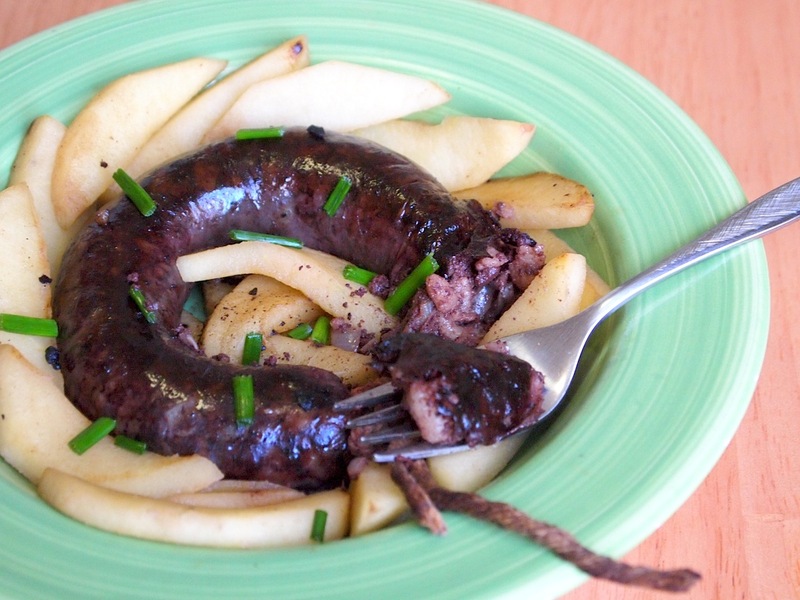 Not so many people would eat blood sausage (including myself) AND even cook at home! You must be so addicted. Haha. I LOVED your post today, including…some naughty picture. Haha. even though i’ve eaten pig’s blood in various Taiwanese dishes, i don’t think i’ll ever muster up the courage to actually cook with it! can’t believe it was only $3 in Flushing! lol! btw, i literally LOL’d at the NSFW pic! I was riveted throughout this whole process even though there’s no way I’ll ever be able to try the stuff. I’m a wuss when it comes to anything with the word offal involved. Great post though. 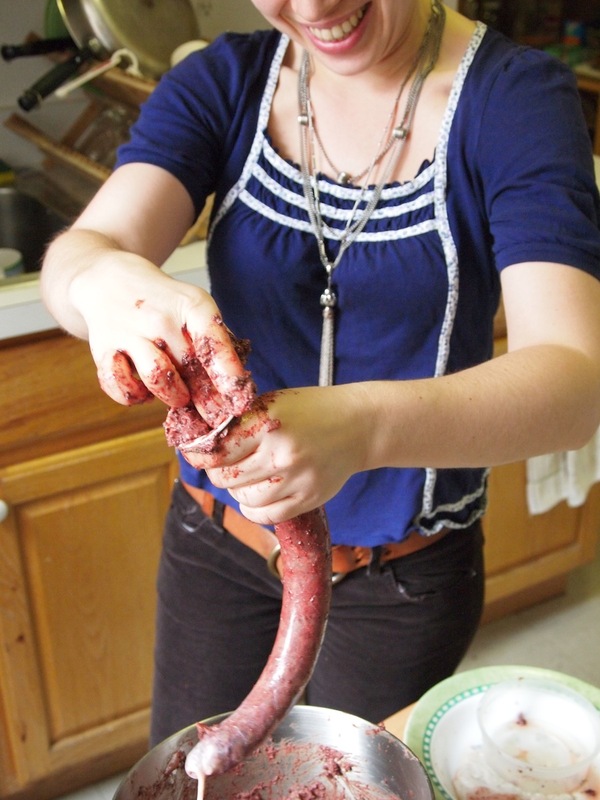 What a fascinating experience making your own blood sausage! The apples go perfectly with it! how. cool!! you earn some serious street cred with this, celia. and i LOVE soondae, though i can’t find the time to battle LA traffic to get down to the korean markets where my family used to buy it. and congrats again on the saveur nomination; so awesome. ← Royal Wedding Breakfast: Chocolate-Orange Princess Cakes…and Saveur!